Many of the rumors from last year's iPhone XS and XS Max had come true, such as the new naming convention, the exact sizes, dual-SIM functionality, an upgraded processor, OLED display technology, an IP68 dust- and water-resistance rating, and a TrueDepth camera with Face ID for both models. Rumors for that 2018 lineup that never came true included Apple Pencil support, split screen on the Max (it ended up being split pane for only a few stock apps), and a USB Type-C power adaptor with Lighting to USB-C cable in the box. There were definitely more true rumors than false, and it's likely the same thing will happen for the iPhone 2019 models. But which rumors will end up being the true ones? Just like last year, it's a sure bet that there will be three different iPhone models to purchase in late-2019. All three devices will be successors to the current lineup, according to famed analyst Ming-Chi Kuo and other sources. We'll only be discussing the successors to the iPhone XS and XS Max in this article, however, not the newer iPhone XR upgrade. While there aren't any leaks or rumors from any analysts, it's almost a sure thing that the new 2019 iPhone models will take off where their predecessors left off. That means we're looking at an iPhone XI and iPhone XI Max, pronounced as the iPhone 11 and iPhone 11 Max. It's still way too early to have any good idea of when the new iPhone models will be announced and released, as leaked dates usually don't tend to surface until weeks beforehand. However, basing it off Apple's history, it's likely the 2019 iPhone models will be announced in early-September with a late-September release. Last year, the iPhone XS and XS models saw that time frame, with a Sept. 12 announcement, preorders on Sept. 15, and a release on Sept. 21. The previous Plus and regular models had very similar time frames ever since Plus size models were a thing. There are no surefire rumors yet on storage sizes, but it's likely that they will follow suit with last year's devices, with 64 GB, 256 GB, and 512 GB for the two iPhone XI models. As with all iPhones, there will be no expandable storage options. No prices are rumored, but they could end up being very similar to last year's devices. AppleCare+ will also be an option, with the same monthly and full-paid plans at $199 for the basic offering and $299 for the one that includes theft and loss protection. Monthly plans are also available, but they will end up costing you more in the long run. Nothing has leaked yet regarding the overall frame and finish. The former will likely be very similar to the iPhone XS and XS Max models, with glass on both sides (to maintain wireless charging) and a rounded "surgical-grade" stainless steel metal frame. There has been chatter about the frame being non-rounded like the 3rd Gen iPad Pro models, but we don't expect this to happen. Finish colors could be the same, with space gray, silver, and gold options, but Apple usually switches or adds at least one color during releases, so you never know. This year, that extra one could be a new blue color, as seen in recent leaks. With Apple's constant eco-friendly message, we expect the new iPhone XI and XI Max to be free of mercury, arsenic, brominated flame retardant, PVC, and beryllium. It will also likely have a low-carbon process, and include a stainless steel frame that can be recycled. That's a start for eco-friendliness, but Apple will have to also win the green crowd over by revealing where materials come from and how they recycle. There are no definitive leaks yet for dimensions, weight, and supported carriers, but if history has any guidance for us, they'll likely be the exact same for the iPhone XI and XI Max as for the iPhone XS and XS Max. As for dust- and water-resistance, Ming-Chi Kuo expects Apple to retain the IP68 rating. So these models will be dustproof and can be submerged in water up to 2 meters for 30 minutes. And as the majority of smartphones, all the major mobile networks operators will be supported. For the environmental operating requirements, there's no reason to believe Apple will change up anything. Since at least the iPhone 7 models, it's been the same on every iPhone. 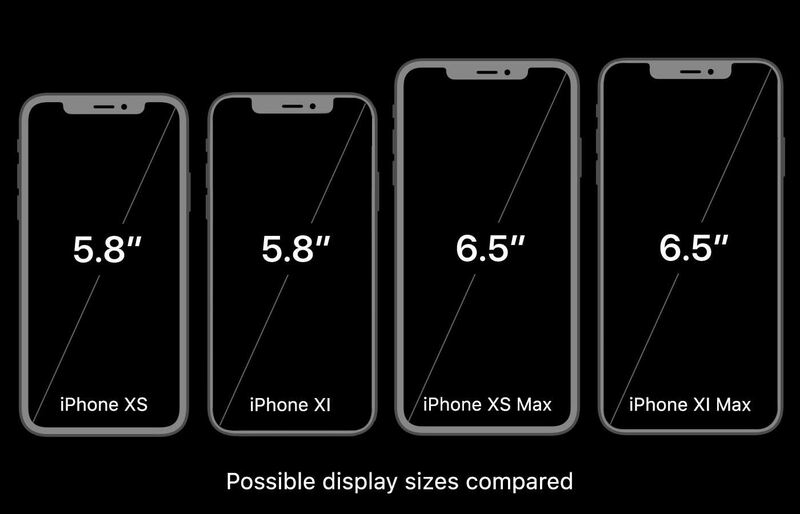 Apple is expected to retain the same display sizes from the iPhone XS and XS Max for the newer iPhone XI and XI Max models, so that means we're getting a 5.8-inch and 6.5-inch display, respectively. Resolution and pixel density may be the same as last year's models too, as well as a 19.5:9 aspect ratio, but it's too soon to say for sure. These displays will also be the same OLED technology from previous models, though rumors suspect that we may have even thinner bezels this time around. 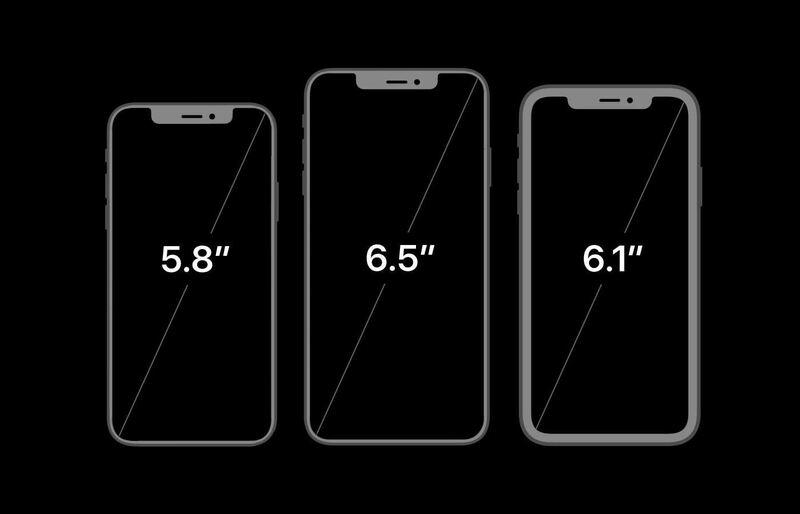 However, there are no details yet on how much thinner they will be, so there's no telling what the screen-to-body ratio will be. Thinner bezels also bring up the possibility of a smaller notch. With rumored improvements for the TrueDepth camera and the speaker grille being moved up, the odds of a slightly smaller notch are higher. Pretty much every iPhone model I can think of had 2 nits minimum brightness and 625 nits maximum brightness for the display, and there's no reason to believe that will change on the iPhone XI and XI Max. However, rumors speculate that Apple will finally move up from a 60 HZ screen refresh rate to either 90 or 120 Hz, making it even better competition for the best gaming phone. Color temperature does vary from iPhone to iPhone, so this is anybody's guess until a substantial leak happens. This spec doesn't usually tend to be a part of leaks, historically speaking, so we probably won't know this until people get their hands on the devices in September 2019. One of the biggest changes to the display that's rumored to happen is the loss of 3D Touch. Apple already ditched 3D Touch in favor of Haptic Touch on the iPhone XR, but that was for an LCD panel. Haptic Touch is nowhere near ready to replace 3D Touch at this time, and it could be that another technology could replace 3D Touch in OLED displays. However, almost every single leak for the 2019 lineup so far is betting on no 3D Touch — we hope that's not the case. Not much is known right now regarding the iPhone XI and XI Max performance stats except that Apple will have improved AR13 chips over 2018's Bionic A12 models. Apple will likely not go below last year's 4 GB or RAM either. However, if the Max is going to get three lenses on the rear and a time-of-flight upgrade (see details below), there might even be more memory, such as 6 GB. Batteries in iPhones never stay the same size as in previous models, and the regular and Max versions also never have the same capacity. There's no telling yet what the capacity will be for the iPhone XI, but if you believe the rumors, the iPhone XI Max will come with a 4,000 mAh battery — 826 mAh more than the iPhone XS Max. Actually, if you believe recent leaks, the iPhone XI will also come with a huge 4,000 mAh battery. It's unlikely both will be, as the smaller model always has a smaller battery. As of right now, all wireless charging iPhone models max out at 7.5 watts, but there are claims that both of the XI models will support 15 watts instead, which is totally possible since Qi technology supports it. It's also possible this might not happen to keep the temperature down inside the body, but we're hoping Apple finds a solution to that issue. Either way, it will work with all Qi-certified charging pads, and maybe we'll finally see Apple's AirPower charging station. For wired charging, there are various rumors that say the 2019 iPhone models will finally get USB-Type C ports instead of Lightning, like the 3rd Gen iPad Pro models. This also means Apple will include a USB-C power adapter with iPhones for fast charging, so you might not have to buy a Lightning to USB-C cable and wall adapter anymore to increase charging speed. There will be improvements to Face ID (see "Security" section below), but when it comes to photos and videos, there are no details besides the possibility of a 10-megapixel shooter instead of the 7 MP that the iPhone XS models had. Image stabilization will likely be software-based, but it could also get optical as well. No zoom or RAW support, as well as a screen flash, are also likely to return on these models, though, there could also be improvements here too. This year, the game changer for the iPhone XI Max will hopefully be a triple-lens camera. 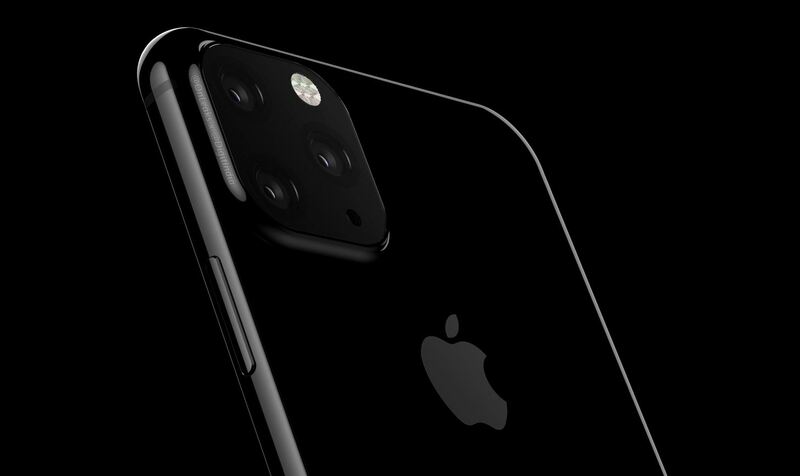 Previous rumors have speculated that the regular iPhone XI will retain the two-lens setup, but a recent design leak tells a different story, one where both the iPhone XI and XI Max will have triple rear cameras. Japanese blog Macotakara claims it will be on both models but that it will only be on the iPhone XI with large storage amounts, while smaller storage models will stick with a dual-lens setup. Either way, two different renders made available by leaker Steve Hemmerstoffer, aka @OnLeaks, show two very different looks for the camera layout. One's a square on the top-left with the lenses in a triangle, and the other's like on the iPhone XS models in the top-center but with the lenses aligned horizontally and its flash circling the middle lens. 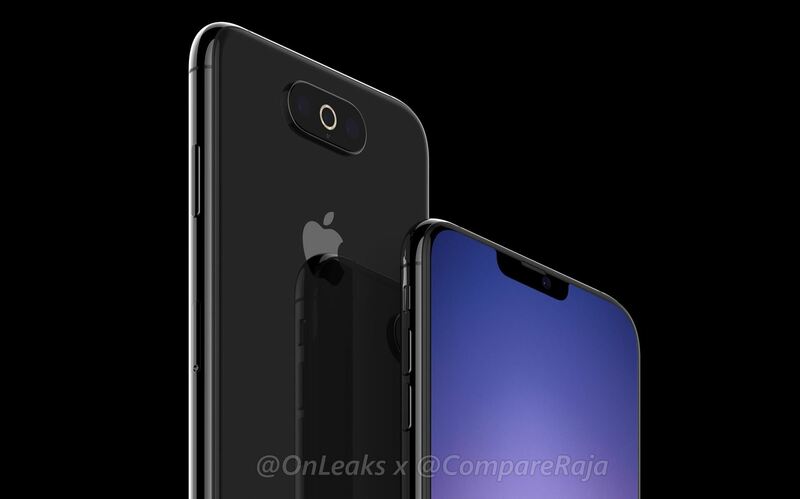 Either render is possible, as Apple is still getting design feedback, but CompareRaja's inside sources claim it will likely be the unit in the top center, as the square corner design didn't fare well in testing. However, newer leaks prove that claim wrong and that Apple will indeed go for the square unit in the top left of the rear. This is further evidenced by a purported chassis for the new iPhone models leaked on Weibo and tweeted by Ben Geskin on April 4. This matches up with a previous leak on March 28, also from Weibo, that shows the possible schematics of the iPhone XI and XI Max design. Whatever look Apple goes with, the main concept will be three camera lenses. Rumors suggest the added third camera will knock the optical zoom up to three times (hopefully, 5x optical zoom like on the recent Huawei's P30 Pro and Mate 20 Pro, something Oppo/OnePlus is also working on), compared to two times on dual-rear iPhones. The setup will likely be a telephoto lens, wide-angle lens, and super wide-angle lens. Having three lenses will also likely improve shooting in low-light conditions. With three lenses, there's also the possibility that Apple will make the system a time-of-flight (ToF) camera for some serious depth-sensing that's perfect for augmented reality, 3D maps, and object tracking. Rumors suggest chips could be made by Sony. However, Ming-Chi Kuo believes there will be no three-lens system with ToF capabilities because it does little to improve photography and meet Apple's goal for AR superiority. So, there still seems to be debate on the issue. There will likely be a jump up in resolution from the 12 MP lenses on the previous devices to 14 MP, though rumors suggest one lens will only be 10 MP while the other is 14 MP. For the iPhone XI Max and possibly some XI models, it's not yet speculated as to the resolution of the possible third lens. However, this pales in comparison to Huawei's P20 Pro that has a setup with 40 MP, 20 MP, and 8 MP lenses. On top of that, the P30 Pro has the same setup plus a fourth ToF lens. Apple has some catching up to do. No new changes regarding audio functionality are expected to change from the iPhone XS and XS Max models, so there won't be a 3.5 mm headphone jack, there will be stereo speakers, and there will be three mics total. The usual sensors will be on board the 2019 iPhone models, though, it's possible there could be another sensor or two. It's also possible that one of the ones listed below will be nixed if a newer sensor can perform its duty. As mentioned before, we might see a USB Type-C port on the iPhone XI and XI Max instead of Apple's proprietary Lightning port. Aside from that, Bluetooth 5.0 and NFC will be included, and there will be dual-SIM capabilities for one Nano SIM card and eSIM. One big change is the rumored jump from Wi-Fi 5 to Wi-Fi 6, which will give you higher speeds and better performance in crowded areas, and will likely also result in less battery consumption. However, not all hardware is Wi-Fi 6 compatible yet, so even if the new 2019 models come with Wi-Fi 6, you may not be able to use it everywhere you go. It's not yet known what antennas will be used for Wi-Fi and cellular connections. Also, there are rumors that the next iPhones will be 5G capable, but those rumors are pretty thin at this point, with most pointing toward the 2020 lineup. Last year, it was speculated that the iPhone XS Max would at least get Apple Pencil support, but that never happened. The rumors are back for Apple Pencil support on the iPhone XI Max, but no word on the smaller XI model. Both the iPhone XI and XI Max will feature Face ID for facial recognition, thanks to the TrueDepth camera. The accuracy of Face ID could also be improved with the rumored flood illuminator improvement, according to Ming-Chi Kuo. The new flood illuminator would filter invisible light out of the ambient environment so a better face scan can happen. Face ID will still have a one-in-a-million chance that someone could break into your iPhone (minus twins). And it's used for Apple Pay purchases online and in stores using either a connected card or your Apple Pay Cash balance. There will also still be USB restricted mode, which stops unwanted devices from connecting and stealing data via a wired connection. When the iPhone is connected to a computer, the passcode (not Face ID) will be required to give access. This is a no-brainer, but the iPhone XI and XI Max will ship with iOS 13 installed. Supported features will include FaceTime video calling using either Wi-Fi or cellular, FaceTime audio, voice over LTE (VoLTE), Wi-Fi calling, and full Siri support. Many language options will be available for the system, QuickType keyboard, Siri, dictation, dictionaries, and spell check. We can assume audio support will be the same as previous models, with playback of AAC-LC, HE-AAC, HE-AAC v2, Protected AAC, MP3, Linear PCM, Apple Lossless, FLAC, Dolby Digital (AC-3), Dolby Digital Plus (E-AC-3), and Audible (formats 2, 3, 4, Audible Enhanced Audio, AAX, and AAX+) files. We can also assume video playback will be the same with supprot for HEVC, H.264, MPEG-4 Part 2, and Motion JPEG, as well as High Dynamic Range with Dolby Vision and HDR10 content. The included components when purchased will be the same of the 2018 models, with the hopeful exception of USB Type-C for the cable and wall adapter. It's not known what wattage the wall adapter will be.